Nursing organizations are specific to nursing subspecialities or population served and provide an avenue for nurses to connect in a specific area of nursing. Organizations have committees or elected positions in which nurses can volunteer to join if interested in serving in a leadership position. Nursing organizations are a powerful tool to mobilize a large number of nurses around a specific topic area. Additionally, organizations typically hold an annual conference in which nurses can share research and ideas to educate and engage others on climate change and health. 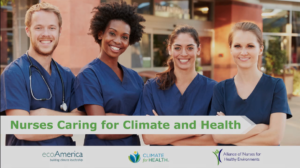 ANHE has partnered with ecoAmerica as a founding partner of Climate for Health, a national initiative that brings together leaders and institutions across the health sector that are committed to advancing climate solutions to protect the health and well-being of all Americans. Through this partnership ANHE has formed the Nursing Collaborative on Climate Change and Health, a partnership between nursing organizations, which aims to elevate climate change as a health priority, create a nursing literature community, and build collective support and action for solutions among the profession. Develop a policy statement, resolution, or position paper on climate changeand health, with emphasis on population specific vulnerabilities. Create a presentation or workshop to introduce to fellow members at your organization’s next annual meeting. Urge organization’s to designate climate change a conference theme. Promote climate change educational events for nurses and community members. Encourage their nursing organization to join on to the Nursing Collaborative on Climate Change and Health. The Nursing Collaborative on Climate Change and Health is an excellent example of how nursing organizations are leading on climate solutions. To learn more about the collaborative, the nursing organizations that are leading the way, and how your nursing organization can join here. Additionally, other nursing organizations have aimed to raise awareness about climate change as a health issues that nurses should address. The American College of Nurse-Midwives, American Nurses Association, and the National Students Nurses Association have all developed policy statements or resolutions on climate change and health. See the policies in the resources section below. Canadian Nurses Association paper on the role of nurses in addressing climate change. Position statement from the Canadian Nurses Association on climate and health in English and French. The International Council of Nursing has developed an online toolkit outlining the nurses’ role in achieving the United Nations Sustainable Development Goals. Topics addresses include climate action, affordable and clean energy, and sustainable cities and communities. The American Public Health Association has a variety of resources for health professionals on climate change and health. The UK Green Nurses Network, a new initiative developed in partnership with the Centre for Sustainable Healthcare and the Royal College of Nursing, is an online community for nurses, students, nurse educators and retired nurses who take the threats from climate change seriously and wish to work together to establish what this means for nursing practice. National Nurses United’s website contains resources on climate science, fracking, and environmental justice.